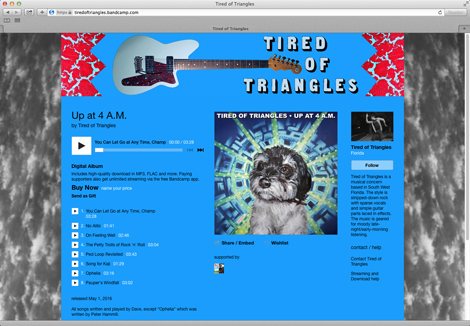 May | 2016 | Dave Andrae's "Blog"
My new musical concern Tired of Triangles releases its debut recording Up at 4 A.M. this week. I think the album represents a nice sequence that works best as a whole. Up at 4 A.M. consists of 8 songs in just under 23 minutes, with each track being a bit different than the ones before it. 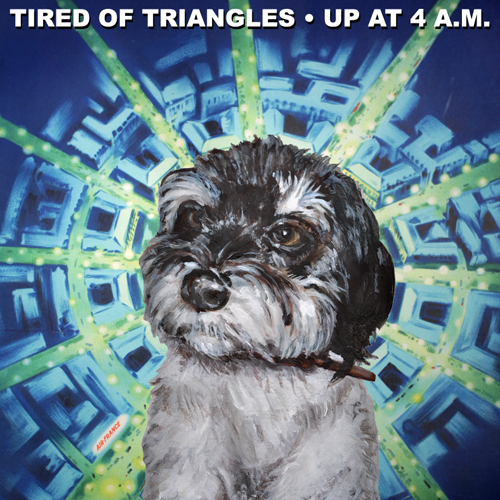 The general style of Tired of Triangles, on this outing at least, is moody stripped-down solo rock geared for late night or early morning listening. A lot of the songs are oriented around simple guitar parts laced in effects with sparse vocals popping up. While it’s a tad tempting to expand on that description and maybe wax poetic on this, the newest detour in my artistic journey, I will refrain from that here and just say that I hope you like it.